Hi there! I have been promising to post photos of my craft studio for a LONG TIME, and I'm happy to say that today is the day! YAY! 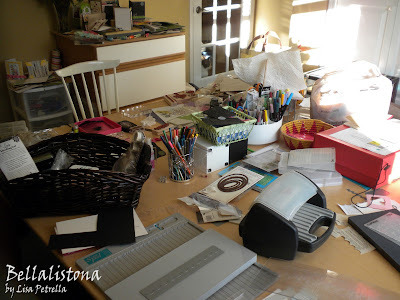 When I get creative I make a HUGE mess---it's just part of my process I guess! So, most of the time my craft studio is NOT neat and tidy! And most of the time when I "attempt" to clean it, I end up sitting down at my desk and making something instead...HA...oh well...I don't know about you, but getting inky is WAY more FUN than cleaning in my opinion! So, I just roll with it *wink*! My husband made that GIANT table and storage shelf for me, and then I painted it (you'll see more details in later photos). 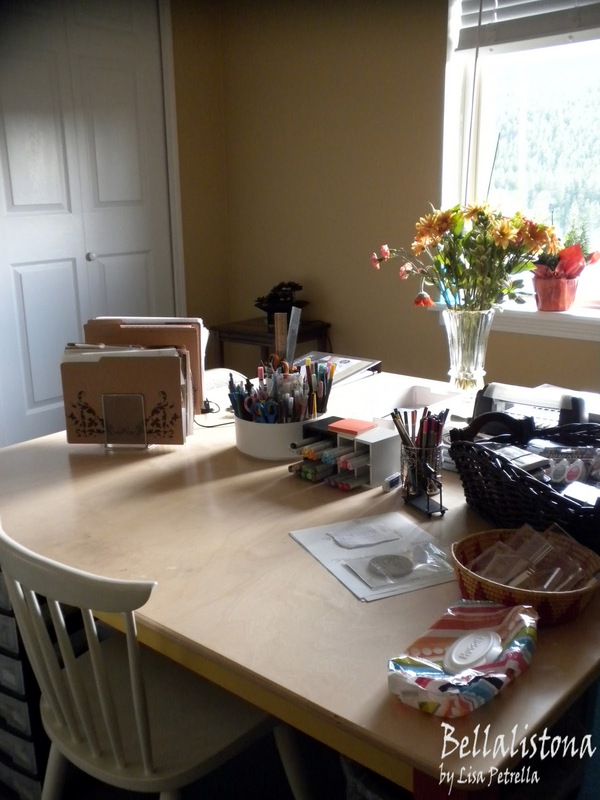 I'm really lucky to have an extra room in our home to use as my craft studio! And I LOVE that it has a door so that my darling little cat, Oliver James, doesn't get into my supplies when we're not looking *wink*! If you look closely in the very first photo of this post, you can see him peeking in the window of the door!! He LOVES this room! But he's definitely NOT allowed in here unsupervised! HA! 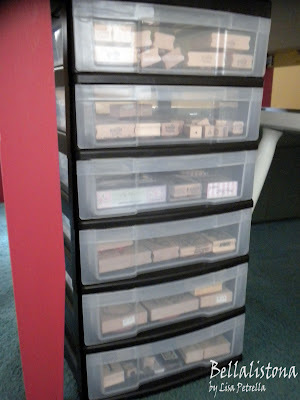 I bought this to organize all of my wood mounted stamps! I never really had that many----until I discovered DeNami Design!!! Aahhhh...swoon!!! Here's a close-up of the storage shelf. I used painters' tape to create the checkered border and then freehand drew and painted the design. I'm not an artist by any means, but I had A LOT of fun working on this! Here's the front of the storage shelf. The slots down the center are one of my favorite features---so perfect for all of my cardstock! Here's a shot of the other end of the storage unit also painted by yours truly! I've seen several of my blog friends storing their ribbon like this (in the jars with the clothespins), so I thought I'd try it! 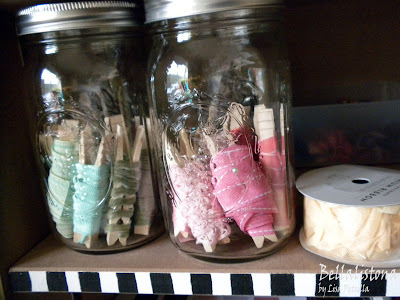 I need to purchase more clothespins and jars though to finish organizing the rest of my ribbon. It makes for such a pretty display, don't you think? 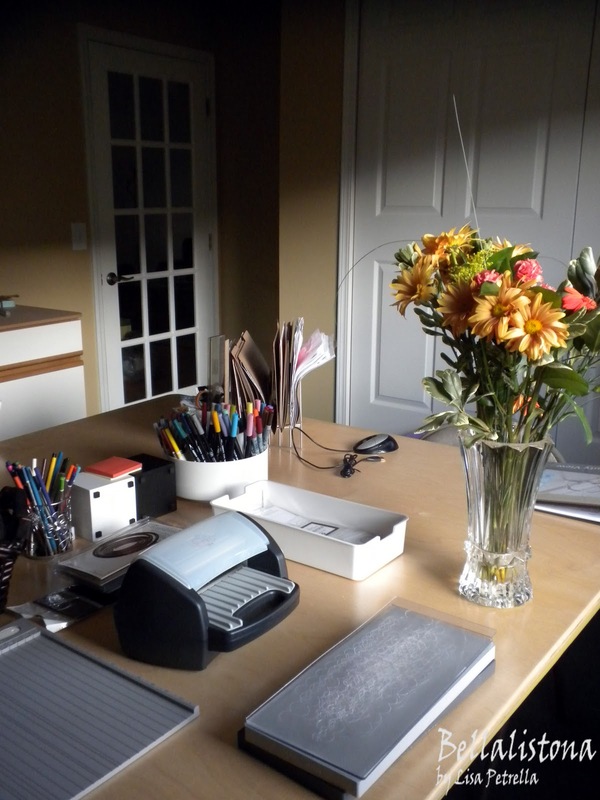 Another view of my workspace. 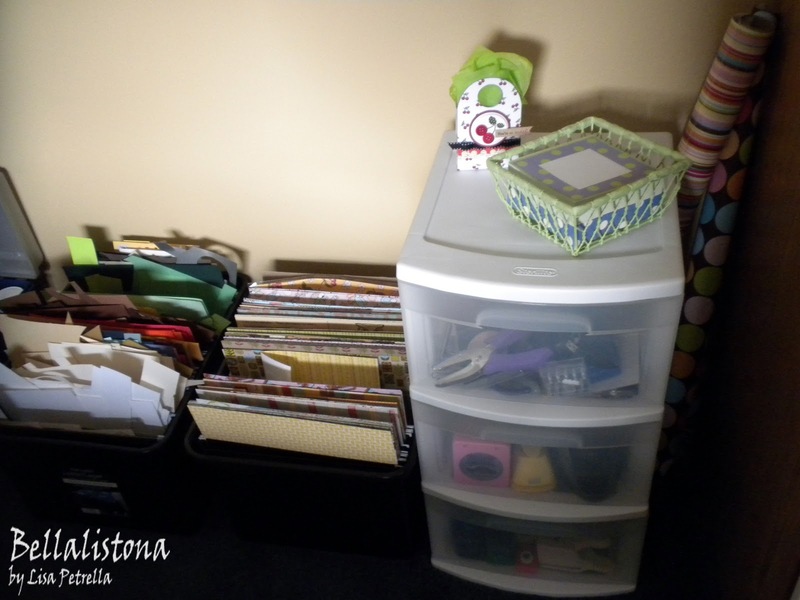 I use these two filing bins to organize my scraps (by color) and my patterned paper (by Company). The white storage unit holds my tools like punches, edge distressers, corner rounders, etc. In this last photo, I'm trying to caputure the view I have out my window. The lighting makes it tough (too dim in the morning, too bright in the afternoon). But, you can kind of see the pine-covered mountain across the canyon from our home----it's a really peaceful and gorgeous view! 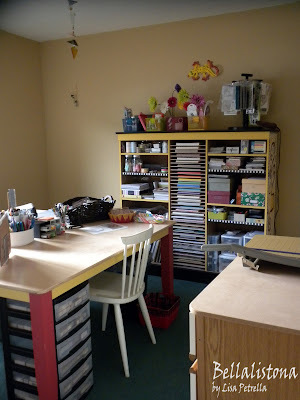 I hope you enjoyed seeing my craft studio! I have some additional organization and decorative ideas to implement in this space in the upcoming months, and I'll be sure to share those with you as they are completed! Thanks for stopping by today! OH Lisa! 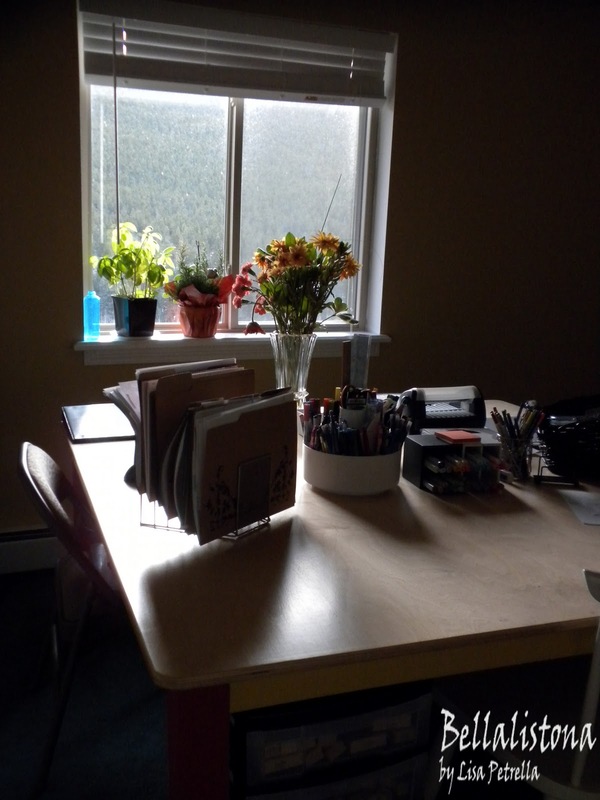 What a wonderful creative space! Your studio is fab! 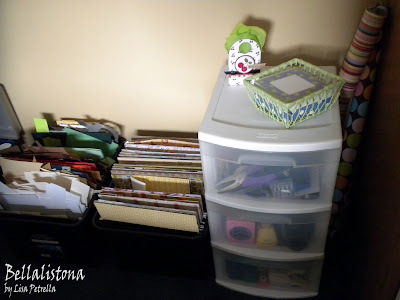 I LOVE your cardstock slots!! You decorated everything so fun! LOVE that you painted it yourself!! You're so talented!! Nice! 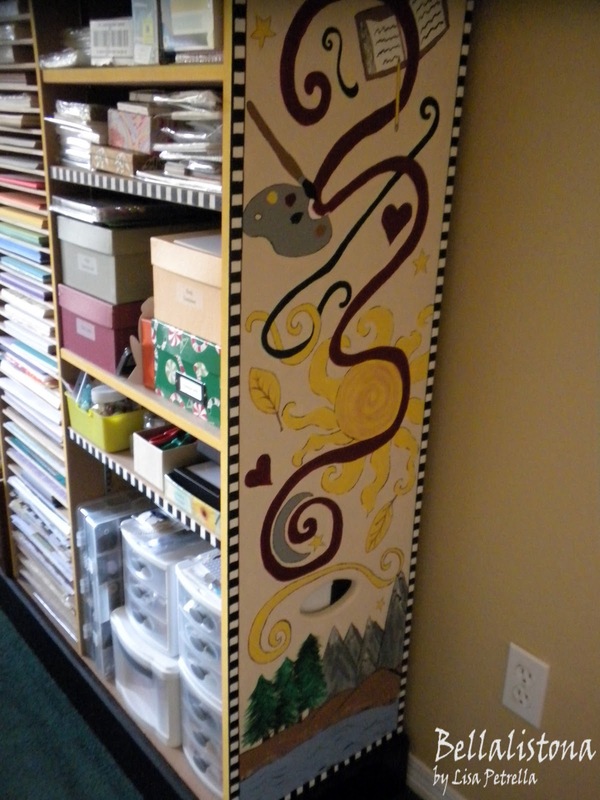 I love your hand painted storage units. My kids both noticed that we have the stamp wipe container (ha ha. Your room looks amazing! Isn't fun to organize and have everything in the right place! I so want to come over and visit! And stamp!!! First of all you lucky girl with that view. On one had it can be inspiring and on the other it could be distracting! 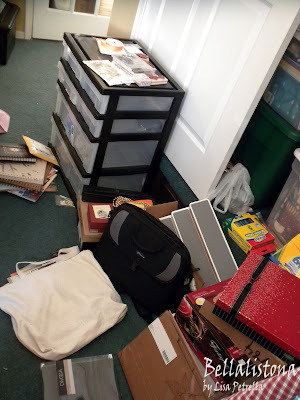 :-) And I agree, 90% of the time my work area is covered because I go from one project right to the next and I don't want to stop to clean up because it's a lot more fun to keep "playing" and yes I am envious of anyone who has their own craft working area. Hoping that our next home might have a bonus room or crafting space. Thanks for sharing! 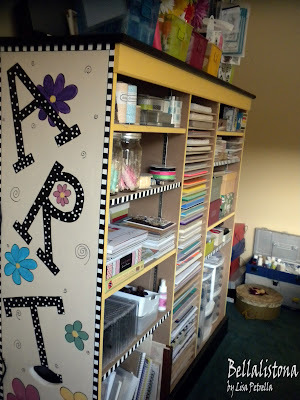 I loved seeing your crafting space! 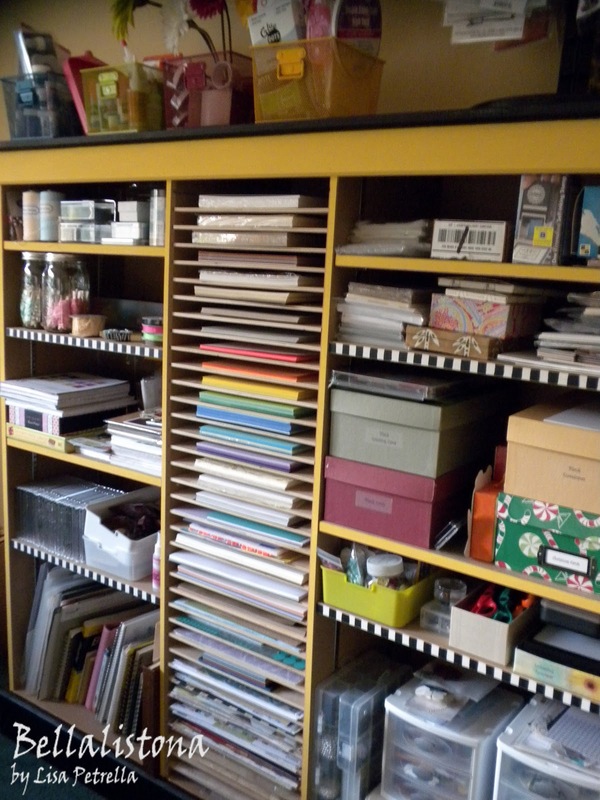 That cabinet is fabulous and you are one crafty talented lady! Your drawing is great! **I laughed when I saw your Huggies wipes in the photo. I never go without those! After finishing, I had to scroll back up to see the cat. Ah, too bad, so sad, poor kitty misses mommy. I do the same with our dogs in my studio area because that's also where I let my baby play with his toys; the dogs like all kinds of toys. They look sad when they can't be in the same room with me and the baby. You have a smokin' hot craft studio, lucky! I love windows with great views, ah I can just picture it. Everything means so much more when they are handmade with love! It's nice of your hubby and I can tell you appreciate it because you took it further and hand painted your lovely piece!